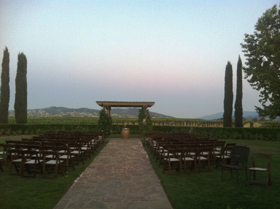 We just finished a beautiful wedding in Temecula at the Ponte Winery. What a perfect wedding venue. Our bride had her cocktail reception on the patio over looking the vineyards at sunset. Then her reception was in the Vineyard Pavilion room which accommodated a large group. The food was excellent both in taste and display. After the reception some of the guests went over to the adjoining hotel Cellar Lounge for a wine down. The winery is a short drive from San Diego so it is convenient for out of town guests flying in. The hotel and hotel grounds were really pretty and they had outside patio areas overlooking the vineyards. A very relaxing atmosphere. Please share with us any other venues in the San Diego area. Our brides are always requesting names and ideas.